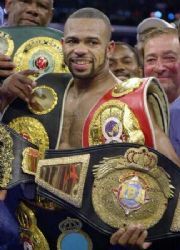 No Way Roy Jones Jr Can Win a Title One Last Time…...Or Can He? On Saturday 15th August the man they call Superman turned back the clock to put on a vintage performance that reminded us why he was once thought of as the finest fighter to enter the square ring. Jones who has recently turned a staggering 41 put on a master-class throwing combination's most fighters could only dream of, bedazzling Lacy with 8-9 and 10 punch combination's, all whilst clowning and playing up to the crowd in a way only Roy Jones can. The fight was stopped at the end of the tenth round, with Lacy’s corner finally showing mercy on their man. The ending was inevitable with Jones dominating from start to finish. It was hard to believe you were watching a 41 year old man who is supposedly shot throwing punches so fast that they still looked quick when shown during slow motion replays. Lacy had no answer for Jones speed, skill and overall talent and based on how good Jones looked it is hard to envisage many fighters with the capabilities to deal with such prowess. Now firstly lets not get ahead of ourselves, it’s important to be clear about the facts, the man Jones schooled was former Olympian Jeff Lacy who is way past his best to say the least, Lacy has not won a meaningful fight for quite some time, and has been prone to being outclassed on a number of occasions more recently by Olympic team-mate Jermain Taylor and none more so than future Hall of Famer Joe Calzaghe. And lets face it Lacy has never really been great, it is possible that Jones would have dealt with Lacy the same even if Jeff was in his prime. As great as Jones looked it’s important not to jump on the bandwagon that he can still be a major force, while one can not totally rule out this notion, it seems unlikely, as a hungry young fighter such as Chad Dawson may prove in the near future, still though this does not mean Jones can still win a belt or perhaps even more importantly a meaningful fight, and when I say meaningful I don’t mean winning the IBO Cruiserweight title against Danny Green, because one, everybody knows the IBO title is not classed as a legitimate belt and two Danny Green, with all due respect is no World Beater. It’s hard for boxing fans myself included to continue to watch and support Jones when we all know he is a shadow of his former self, but what must not be forgotten is that even a 80% Roy Jones is better than 90% of the competition out there and while he continues to rack up victories in impressive fashion although maybe meaningless to us will mean everything to him, just to still be competing is a victory for Roy as all he has ever known is boxing, without boxing Roy has nothing, the money the fame, nothing compares to the adulation he receives every time his name is announced in the square ring. Even at the tender age of 41 Roy Jones still has enough talent to put on a “show” and this is what the majority of fans pay their hard earned money for, no one and I repeat no can out on a “show” like Roy Jones Jr. If Jones can attain a legitimate belt or a win over a world class opponent it will be the perfect way to end an already remarkable career. Like a huge number of past and current fighters unfortunately Roy is determined to fight on regardless of the potential dangers, whatever happens let’s just hope Roy does indeed finish the way he wants but more importantly let’s hope he does not end up seriously hurt. What can not be argued is that on Saturday night, Jones performed impressively and anyone that argues to the contrary is clearly basing their opinions on factors that have nothing at all to do with what he exhibited. Just like a certain Floyd Mayweather you may not like him, but you have to respect that type of talent. It is the type of talent that you can never write off and if anyone can win a title one last time it is the one they call Superman.